This time last month, I was stressing like crazy about going to Vancouver for my interview. This time this month, I'm still stressing, but I'm reminded that all things that are meant to happen will find a way of happening. After my posting about the job, I got an email from a reader of this blog (I'll keep her unnamed since she didn't publish the comment and emailed me instead) sent me an email offering assistance. She is a fellow Malaysian who moved to Vancouver a few years back. We're now already talking about furniture and where to go and eat when I get to Vancouver, and she has even offered to pick me up from the airport if I need it (thank you! I will keep that in mind if I get horribly lost). 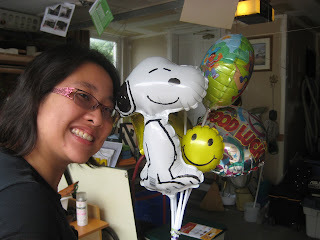 Balloons from cousins to celebrate the Snoopy-themed presentation I did for the interview. It then turned out a friend of mine who is a researcher in a long-term health care facility here told me his wife got her Ph.D. from UBC, and offered assistance. She has been a lot of help advising on neighbourhoods that are safe and close to the university. My colleague-to-be has also been of tremendous assistance with accommodation and services in Vancouver, which I'm very grateful for. And then my cousin's friend's friend heard of a Baha'i family doing homestay on the bus-route to UBC. So I will be staying with this family, and having home-cooked food three times a day! And then I go on to find out that my supervisor/professor stayed in BC for 6 years doing her MA/Ph.D. and had some ideas about life in Vancouver and had some valuable advice about certain things I hadn't thought about. Good luck nai.. Hope it all goes well! :) Hugs!! Good things happen to good people like you Daphne... see you in Vancouver soon!